I posted about my Ankara obsession and I promised to share what I made. I was gifted a wide silver bangle sometime back and I decided I wanted to transform it. I had about two yards of DaViva material with something like animal prints on it. I'm crazy about animal prints and I decided it would be perfect for my new project. When I get crafting, I don't have time to take pictures cos I'm usually impatient to see the finished product of what I have in mind. I will try and change that as time goes on....hopefully. -Sew the two longest end of the strip together to form a tube. Turn this tube inside out to hide the stitches. - Tightly and carefully wind the strip around the bracelet making sure it's tight and smooth. -.Cut off excess material. Bend in ragged end of strip to hide then stitch or glue closed into the inner side of bracelet. I prefer stitching cos it won't peel off with time. Voila! 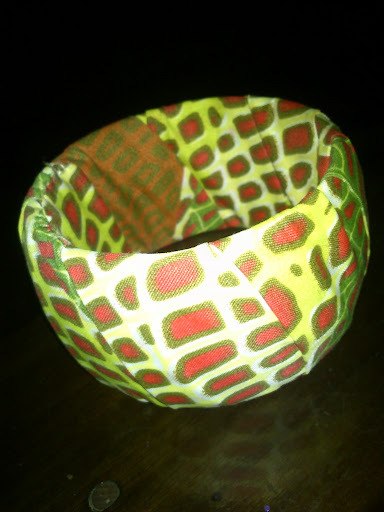 You've made your own Ankara bracelet! Cool - I've been wondering how to do this and other items like shoes. Thanks!